Compete against someone - Live! 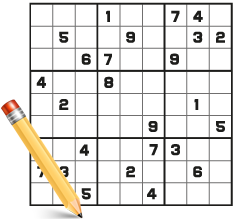 The goal of a Sudoku puzzle game is to fill a 9x9 grid with numbers so that each row, column and 3x3 section contain all digits between 1 and 9. It doesn't matter if you're an absolute beginner or a Sudoku master! Create an account to play multiplayer Sudoku, earn points and get high scores. Live Sudoku is a home for all online Sudoku players from all around the globe. Sudoku has its deep roots in ancient number puzzles and in the mathematical concept of Latin Squares. It is a Japanese word: Su (meaning 'number') and Doku (meaning 'single') however Sudoku originated in Switzerland in the 18th Century and was introduced to Japan via America. Playing free Sudoku puzzles builds concentration and brain power and does not require any special math or calculation skills. Sudoku is based on the logical placement of numbers and playing free Sudoku games daily is a great way to develop your thinking and problem solving skills. Start playing today to discover the benefits. Last Digit / Full House involves simply counting all the different numbers in a row, column and box that are related to one particular cell. If there is only one number missing, then that is the number to place in the cell. Hidden Singles are cells that have only one possible digit available when scanning it's related row, column and box. It involves scanning the rows, columns and box in order to determine where a specific number can be in a given house/region, keeping the unique number rule in mind. For more info and to learn advanced solving techniques visit our Sudoku Techniques section.